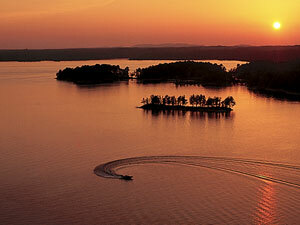 The Ouachitas region shines with the natural beauty of its pristine lakes gleaming amidst dark pine forests to the unique abundance of diamonds, quartz crystals and other gemstones. It's "finder's keepers" when you hunt for diamonds at the Crater of Diamonds State Park. Those seeking outdorrs adventures will also enjoy camping, boating, fishing, horseback riding and golf around the area's Diamond Lakes. The Scenic 7 Byway takes you into historic Hot Springs, the only city in the U.S. with its own national park, where you can refresh at the picturesque, late-Victorian spas along its famed Bathhouse Row. Or catch thoroughbred racing at Oaklawn Park and then stroll through the 210-acre Garvan Woodland Gardens. The city also offers ample opportunities for fine dining and shopping as well as nearby family-oriented attractions and theme parks. To finish your visit, let the Talimena National Scenic Byway transport you along miles of rugged beauty as you weave your way through Ouachita Mountains to the Queen Wilhelmina State Park where you can stretch your legs on a portion of the 223 mile Ouachita National Recreation Trail which passes through this beautifully diverse park.